In today’s modern society, many job hunters look for the best ways to differentiate their resumes from the rest of their competition – and rightly so. After all, in a sea of similarly formatted resumes, bold headers, profile pictures, and personal portfolios a cover letter can really stand out. However, while job seekers in the IT industry concentrate their efforts on constructing the ultimate resume showcasing their talents and skill sets, many ignore the importance of creating a custom cover letter when applying for their positions. The fact is, cover letters are still a vital part of getting noticed by hiring managers and play an essential role in their hiring decisions. Here are three reasons why you shouldn’t skip including a cover letter on your next job application. Remember your resume is not the first or the last one that a hiring manager will be reviewing. The fact is while you may believe your skill sets are the best fit for the company, several other candidates probably feel the same way and have the credentials to back up that claim. While experience and skill sets are no doubt important, your personality and professionalism should be something you want to highlight to a potential employer. Cover letters are a great way to introduce a hiring manager to who you are as an individual. This allows you to set a professional tone that gives insight into what it would be like to work with you. Depending on the position you’re applying for, and how long it has been open, it’s possible your resume could be one of the hundreds submitted. How do you convince a hiring manager that yours is worth looking at? By selling yourself and your resume. Regardless of the position you’re applying for, a cover letter is an excellent opportunity to prove to a potential employer that you’re worth their attention. Take the time to familiarize yourself with the company and the type of candidate they’re looking for. Explain to the employer the content of your resume and why you would be the right fit for the organization. 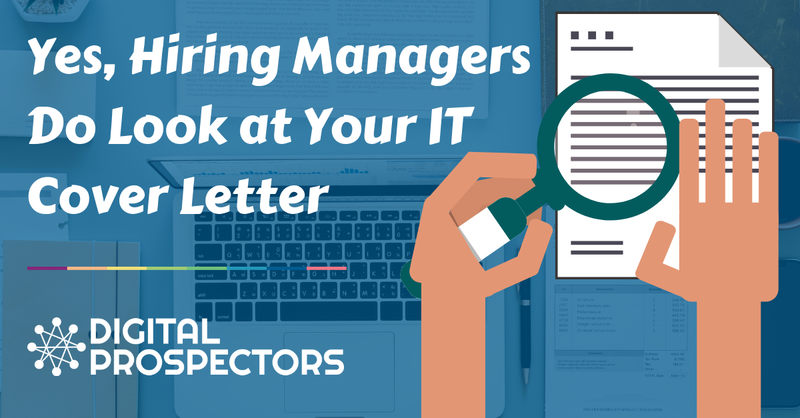 Cover letters are still very relevant in the IT industry and should be considered as important as your resume. By taking the time to create a customized letter to a potential employer set yourself apart from the crowd. If you’re ready to find a job you love, check out our available IT job opportunities today.